The Commons – a new European concept? Inaugural meeting of the European Parliament Common Goods Intergroup. 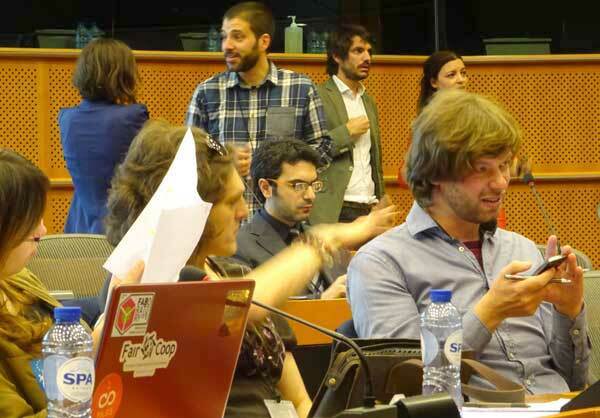 As we gathered for it, this European Parliament Common Goods Intergroup meeting, promised to be intriguing… was the Parliament about to embrace the commons as a template for a more participatory politics? It was indeed a political meeting, with the banners of the four parties who had come together in support of it prominent behind the podium, a coalition that, as Sophie Bloemen details in her excellent account of the intergroup’s formation, had required the mutation (dilution?) in its title, of ‘commons’ into ‘common goods’. Such concerns were quickly overshadowed by the mix of culture shock, optimism, contradiction and sheer linguistic struggle that Europe-wide mutuality turned out to entail. But then this is 28 nation politics and I was new to it. Shock and awe at the huge scale of the Brussels European Parliament building and the hushed modernity of its vast interior – the Charlie Hebdo effect piled onto the Bin Laden effect meant the whole place seemed imprisoned in that other aspect of modernity, security. There were also the twin Britshocks of realising during the meeting that what I was hearing were the voices of southern Europe, Italy, Spain, Portugal and France, and that of the 50-60 participants, I was apparently the only Brit. Coupled with this was the reminder that however good the four-language interpretation was, it put a huge burden on attention, and being able to grasp what was being said – Italian man speaking in the room – English woman interpreter in the ears. The meeting started half an hour late, which despite effective facilitation put all the speakers under pressure. And speakers there were in plenty, arrayed in one-to-many conference style. There were repeated calls for ‘the need for debate’ but debate was overwhelmingly subordinate to a series of charismatic and often vociferous presentations mostly from the podium, peppered with multiple exhortations that the commons and common goods ‘were a good idea’, ‘we must…’ ‘we need…’ ‘we have to…’ etc., etc. Lot’s of talk about commons not much apparently from commons. When I spoke to ask the other delegates ‘who we were’ and how many had direct experience of commoning, around a third of the audience put up their hands, an indicator perhaps that less preaching to the converted would have been appropriate. This was an inaugural meeting, so uncertainty and clumsiness can be excused, however on balance the presentations had a lot to say about common goods resources, i.e. a city’s water supply and much less about commoning, often a fragile flower growing out of peer-to-peer governance, commitment and emotional competence. The meeting certainly seemed in no doubt that a wider extension of the common goods theme might be one way to shape a new and very necessary politics. As Marisa Matias the impressive Portuguese MEP who had convened the meeting said at the end of her introduction, ‘the Left is lost’. Was this a meeting then, as it perhaps seemed, where the old left was trying to befriend a new and promising flavour of the political month? There was no coffee break and apart from casual chat before the meeting, no interaction between the assembled delegates –the old paradigm of a representative polity? And yet… in her introductory remarks Marisa Matias outlined two agenda items, ‘how to think outside the logic of the state’ and ‘how to handle the management of the commons’, both radical contradictions of neoliberal preferences. Perhaps this Common Goods Intergroup event was a way of introducing to an old politics, news of political innovation that was proving unexpectedly and improbably successful. Only days before, Barcelona and possibly Madrid had elected officials with a ‘commons’ agenda; and… Anne le Strat outlined the successful Eau de Paris return of the Paris water supply to municipal ownership (paralleled by at least one other commune I know of in the Ardeche); There were several references to commons rights progress in Spain, and in Italy a supreme court decision had opened constitutional protocols to commons forms of organisation, along with the adoption of ‘beni comuni’ as a legal concept. Alongside this, as Benjamin Coriat outlined, in Barcelona the recovery of the commons appeared to be afoot. A delegate from Transform made a reminder that there was a continuing need for recovery of the many public goods had been given to exponents of capital, she also argued for the establishment of a federation of commons. Paoli Napoli from CENJ, a French judicial research centre argued convincingly in favour of questioning the validity of state monopolies as a way of discovering commons. Ricardo la Fuente a Portuguese Free Culture activist drew attention to the scale of the capture of the internet commons by Facebook and Google, US dominated vertical monopolies that threaten the integrity and freedoms of the internet. He argued that safe-guarding access to the public sphere of the internet was a vital aspect of the commons agenda. Michel Bauwens, a long-time peer to peer exponent, spoke about the digital commons, a driver of the unprecedented social change that underlies the commons movement. Bauwens outlined three digital commons institutions, one: the huge numbers of people who are contributors to the building of open public goods such as Linux, Arduino and Wikipedia etc (not to mention the countless millions of blogs like this! ); secondly: the digital enterprises that feature peer-to-peer governance and transparency, he gave as examples: Loomio, Inspiral etc. ; and third: for-benefit foundations such as the P2P Foundation and many others. Bauwens warned that digital innovation presently tends to be compromised, since to pick up the resources to expand and develop an innovation, means becoming a ‘start-up’ with the likelihood of capture by venture capital. Devising alternative ways of financing commons innovation, he seemed to be saying, will be a vital part of an emerging commons economy. Bauwens left early to talk to the mayor of Ghent about another current proposal – Assemblies of the Commons – he also mentioned generating Chambers of the Commons, mirroring, at least in the UK, the ubiquitous ‘chambers of commerce’ and lastly the need, as he put it, to develop an ‘operating system’ for the commons. All welcome news. In conclusion: Encouraging evidence from across southern Europe that there were a variety of instances of participatory politics inspired by, or already implementing commons/common goods. Great resources: the whole meeting was streamed live and by the following morning a video of it had been posted by the EFDD group with English interpretation. And… the meeting had a classroom format – people sitting in rows facing expert speakers. As a groupwork facilitator I long ago learned that such a format inhibits or prevents the kind of face to face (and peer to peer) cooperation and communal knowing that commoning requires. This is not a minor matter, conversations are shaped by context. If this is the only Parliamentary format for commons/common goods discussion/negotiation/interpretation, I’d be concerned that this infrastructure could inadvertently exclude the intended benefits. And yet… perhaps too much should not be expected from a body such as the Parliament which is devoted to scrutiny and correctivity, not usually a recipe for innovation. The European Parliament is an extant political forum, it mends and bends the proposals of European institutions. Diemut Theato, an MEP I happen to have met, some years ago demonstrated this when, due to her leadership and financial perspicacity, the entire European Commission had to resign. The Parliament’s potential ability to bounce back European legislation that ignores, compromises or damages the common good is very welcome. With regard to the common good, every little helps! Common Goods Intergroup members: the Greens, the left group GUE, the Social Democrat party (S&D) and the EFDD (joint president Nigel Farage) and which now includes Beppe Grillo with his Cinque Stelle party. § 2 Responses to The Commons – a new European concept? Inaugural meeting of the European Parliament Common Goods Intergroup. You are currently reading The Commons – a new European concept? Inaugural meeting of the European Parliament Common Goods Intergroup. at psyCommons.